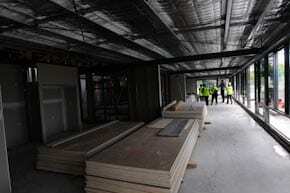 J-Wire toured the the new building which will both house and consolidate the activities of Sydney’s JewishCare. The building stands on the site of the old Burger Centre which was totally demolished a year ago. Costing over $7 million the JewishCare headquarters will see the consolidation of Print 35, the Aged and Disabilities team, the families and communities team and the Club 50 drop in centre for Holocaust survivors into the one space. The Print 35 unit which offers a variety of printing services will sport a brand new shop front, something it never had before, which JewishCare hopes will attract business from the general public. The new building has been financed by the Capital appeal and the sale of existing properties.